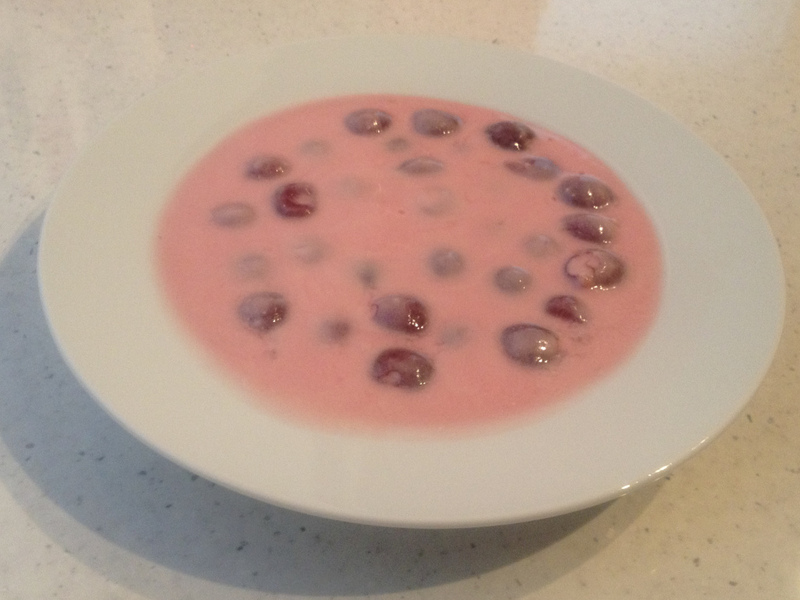 Hideg meggyleves (cold cherry soup) is an unusual, but very good, Hungarian soup; despite containing cherries and sugar, it’s normally eaten as a proper soup and not as a dessert. Usually the soup is prepared with sour cherries, but fresh ones are not easy to find in England, so you can just use normal cherries (that are also quite cheap at this time of the year). If you prefer, you can use fresh, frozen or canned sour cherries, but check they don’t contain extra sugar. If using sour cherries you should use 150g of sugar. Wash the cherries and pit them. Put the pitted cherries in a pot with 1.4 litres of cold water, the sugar, the cinnamon and a pinch of salt. Bring to a boil, reduce heat to medium-low and simmer for about 15 minutes, until the cherries are soft but not falling apart. Remove the cinnamon sticks. In a small bowl, whisk together the flour with a few spoons of hot soup. When mixed, add the sour cream and a few more spoons of soup and mix. Add the sour cream mixture into the soup and mix well. Simmer for other 5 minutes stirring frequently. Cover the soup and let it cool down a bit. When warm, put in the fridge until cold and thick (it will take at least a couple of hours). This entry was posted in soups and tagged cherries, hungary, soup by Marco Barisione. Bookmark the permalink. Interesting! Is this a desert? or an appetizer? it’s sweet (I would assume a desert) but it’s a soup (soups are to me appetizers). I updated the post to make it clear that it’s usually eaten as a proper soup and not as a dessert.